DEXIS CariVu™ is a compact, portable device that uses transillumination technology to support the identification of occlusal, interproximal and recurrent decay and cracks. By hugging the tooth and bathing it in safe, near-infrared light, CariVu’s transillumination technology makes the enamel appear transparent while porous lesions trap and absorb the light. 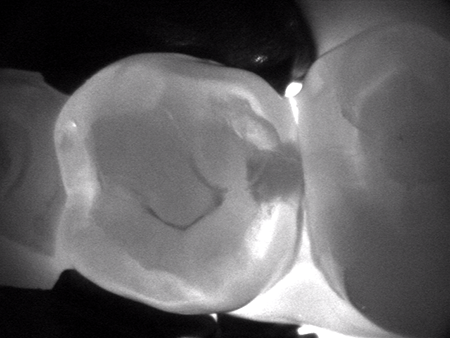 This allows Dr. Hausman to see through the tooth exposing its structure and the presence of any decay or cracks with very high accuracy. When used together, a radiograph, a CariVu image and an intra-oral photo provide a comprehensive picture of the health of a patient’s tooth. Whether your dental needs are a complete exam and cleaning, a full-mouth restoration, or anything in between, we provide you with exceptional dental care. Below are just some of the many procedures and services we regularly provide to our patients – with a gentle touch, and stunning results. Your smile is our first priority, and we’ll give you something to smile about.